From a repair shop, Schecter grew to be a parts manufacturer that supplied guitar companies like Gibson and Fender. It didn't take them long to start producing their own guitars, some which ended up in the hands of professionals like Ritchie Blackmore, Chris Poland, Jeff Loomis and more. While ownership has changed (now owned by the same parent company that owns ESP guitars), the company didn't stray from what made them popular - modded versions of classic guitar designs. The Omen Extreme 6 FR is Schecter's top rated super strat style guitar in the sub $500 price range, thanks to its premium cosmetics, playability and tone. Wood components include a carved maple top on a basswood body, and a 24-fret rosewood fingerboard on a bolt-on maple neck. Shred-heads appreciate its Floyd Rose locking tremolo system, while the two Schecter designed high-output alnico humbuckers give the guitar the tone that satisfies most rock, progressive and rock players. Finally, these pickups feature coil-splitting for single-coil like tones. While reviews are articulated differently, most of them share a common appreciation for the guitar's elegant cosmetic appointments, specifically mentioning that they get a lot of compliments from other musicians and their audiences as well. A good number of commendations were also directed towards the guitar's playability, including the reliability and stability of the guitar's Floyd Rose setup, its weight balance and lightness. The guitar's tone and coil tap sounds are also well received. There are a few initial setup issues reported, but many are able to fix them with minor adjustments. There are also a few that knocked a star off the guitar's rating because of the slight color differences between the picture and the actual guitar, some of them further noted that it could be due to lighting differences. This is a premium looking Floyd Rose bridge equipped guitar that is very easy to recommend, especially if you want the added versatility of coil tapping. 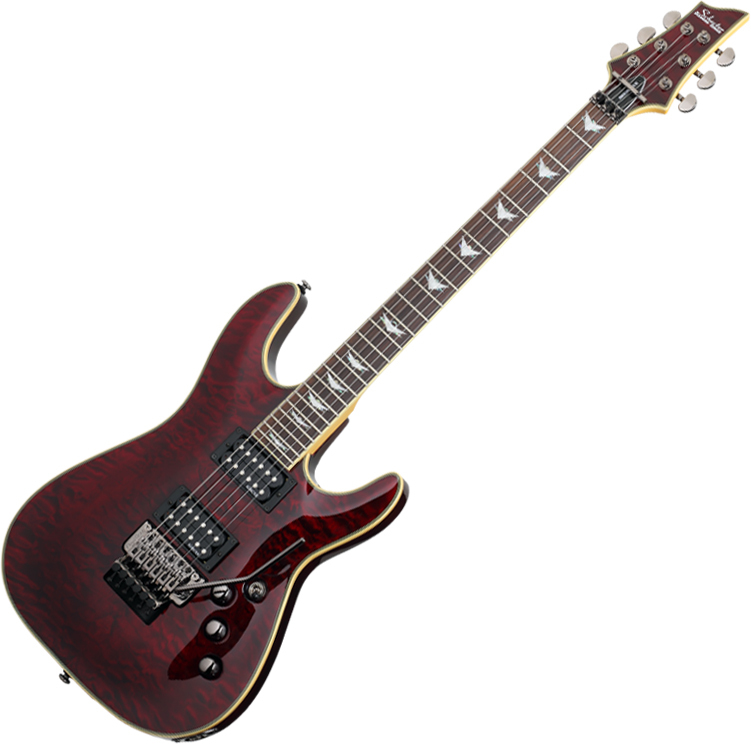 The Schecter Omen Extreme 6 FR was on our recommended list until we performed a detailed review of solidbody guitars between $200 and $500 in March 2019. At that time we found there were more highly rated options with humbucking pickups to recommend and you can find them in our guide to The Best Electric Guitars Under $500.